Peter Klasen was a key personality in the European rise of the New Figuration movement in the late 1950s, when the avant-garde vitality of Action Painting and Abstract Expressionism seemed to be exhausted. An heir to the young masters raised in the spirit of the Bauhaus and German Expressionism, Klasen moved to Paris, where he found inspiration and fertile ground to pursue an artistic career that has been materialised through sculpture, photography and painting. It was through collage, however, that his production became more radical and deep, as he pasted fragmentary images, objects and papers of different sizes, colours and shapes. Klasen has developed a personal, flexible discourse throughout his career, reinterpreting and reformulating modern urban and social iconography according to the aesthetic tradition of Pop Art. 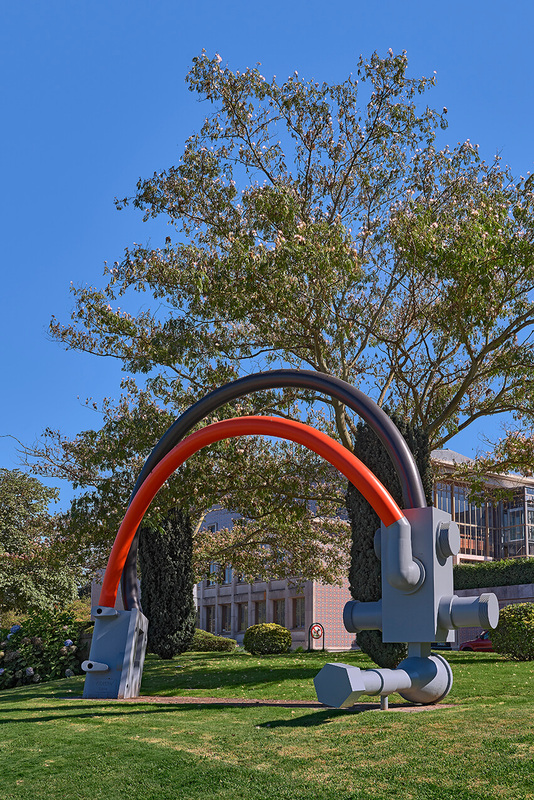 Industrial motifs are also a fundamental characteristic in Klasen’s oeuvre, as can be observed in his large-scale sculptures, including the piece made for the 7th Santo Tirso International Symposium of Contemporary Sculpture in 2004. In this piece, Peter Klasen adopted some Pop Art strategies (as those used by Claes Oldenburg): oversized daily objects are taken out of their contexts, and new relations of scale turn them into veritable icons. Although some details of the sculpture resemble mechanical objects or parts of an electronic device, the truth is that we are confronted with an artefact whose strange spatial design is both alluring and electrifying. Two parts, one heavy and earthbound, the other ethereal, colourful and delicate, trace an arc looking like an example of childish architecture or a gigantic toy construction block.